I got home from work on Tuesday, and all I could think about was my Turtlepurl yarn. I bought it a few weeks ago in Toronto, and it’s been waiting patiently for me, alluring, perfectly wound into a cake. The colours, the possibilities… So naturally, I got home, made a coffee, turned on the Unbreakable Kimmy Schmidt (which I have been unashamedly marathoning), and started searching Ravelry. 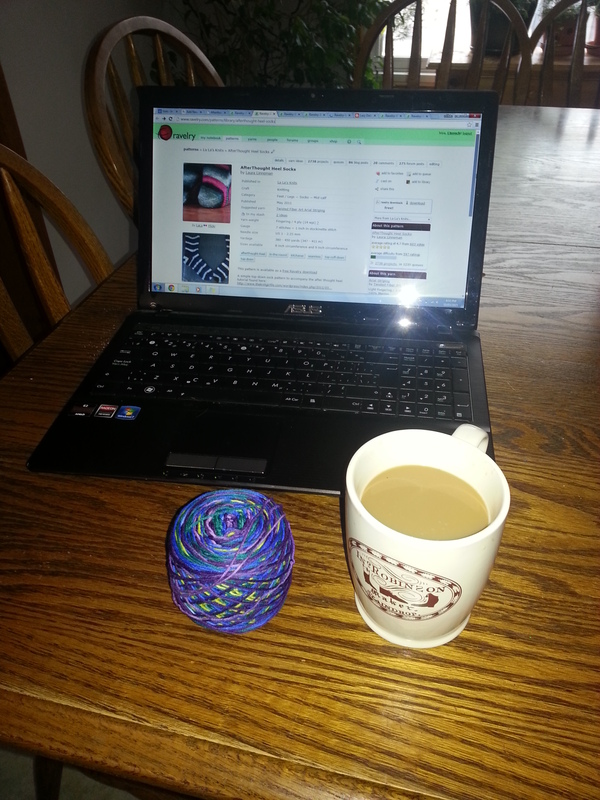 Yarn, coffee, and Ravelry – what else do I need! I’ve had two sock patterns in my queue for quite some time, the Hermione Everyday Socks, and the Petty Harbour socks, but neither of them seemed quite right for this yarn. I thought long and hard about the Petty Harbour pattern – I liked the pairing of a Canadian dyed yarn and a pattern named after a place in Newfoundland, but ultimately, with a vibrant yarn, I felt that I needed a subtle pattern, and I decided on Laura Linneman’s Afterthought Heel Sock, a basic sock which won’t disrupt my stripes at the instep. The thing is, I really shouldn’t be starting another project. I am more than two-thirds of the way finished with Gryffindor Scarf #1, and I really want to finish it within the week, and I have two other pairs of socks already on my needles! I have a very simple, plain sock that is excellent for when I’m travelling into the City, and the other is a more detailed, intricate lace pattern, which required full attention and only a few rows get done in one sitting. But when you have yarn as pretty as my Turtlepurl is, just sitting, waiting to become something even more beautiful, the cast on was inevitable. Just look at that sweet self striping action! I love living close to a big city. In just over an hour’s time, I can travel from my home town to Toronto, and while sitting on the train, I make the trip and don’t even break a sweat. I happily use the time to keep my fingers busy, and socks make the best travel project! I began a very simple sock pattern using yarn I bought months back, Bernat Sox yarn in a fun Desert Storm colourway – it’s khakis, greens and browns and knitting up in a camouflage-esque pattern. When I stashed this yarn, I always knew it would end up being socks. While in TO, I was able to visit two yarn shops. The first was The Knit Cafe on Roncesvalles. My sister discovered this shop in her neighbourhood a few months back, and she didn’t wait to text me to say ‘you need to come visit and check out this shop!’ Well, I finally checked it out on Saturday, and it was a lovely shop with very friendly staff and an interesting selection of yarn. I was very excited to leave the shop with new needles (I have a thing for knitting needles… I just love them and adding to my collection), and two hanks of sock yarn from Turtlepurl Yarns, an ‘indie’ Canadian yarn dyer. 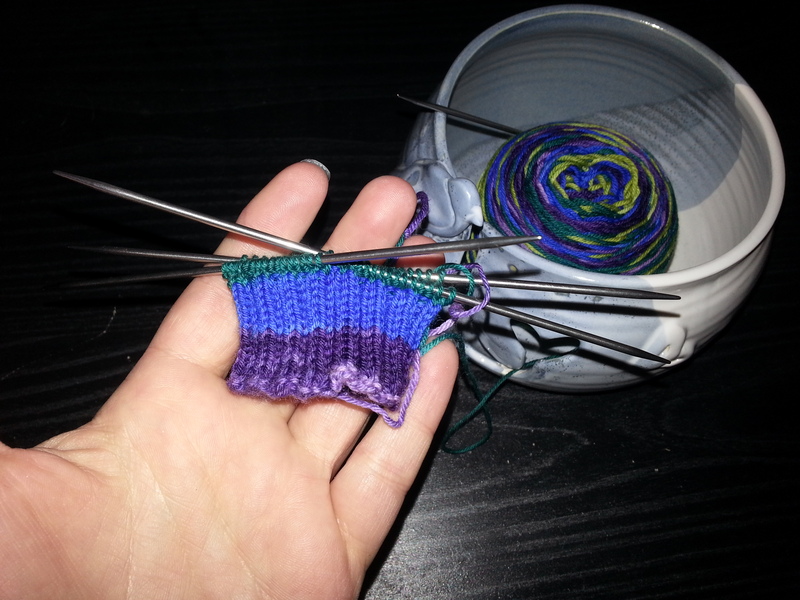 The yarn is their Striped Turtle Toes, and when they are complete, they will be two identically striped socks. This makes me happy. They are already wound – any excuse really to use my swift – and they are ready for casting on whenever I am ready for them. The other shop I visited was Romni Wools on Queen West. I once saw this places described as ‘an Aladdin’s cave for knitters,’ and whoever came up with this apt description wasn’t wrong! A huge shop with great selection, rows and rows of yarn. After I left Romni, without making a purchase (this time), I’ve realized that I have a hard time buying yarn for the sake of buying it. I have a hard time justifying buying yarn unless I know that I can use it for something. Sock yarn is one exception, because it has an obvious project that can be completed with it. However, buying the odd ball or two, or more even, just to buy it, I just can’t do it. So I left Romni without making a purchase, but the next time I go back, I’ll have a project in mind and I’ll find the perfect yarn there. Really, half the fun is in the discovery. Do you have a project that you love and hate at the same time? 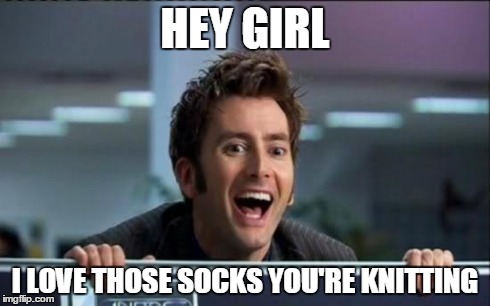 For me, it’s socks. They are the project that I love to hate, or hate that I love. I was well into my knitting addiction when I began my first pair. I bought a skein of Berroco Comfort Sock, soft and purple, from my LYS. It was perfect for my first pair of socks. It is self striping and created a lovely mix of colours, and I chose a fairly simple sock pattern with lots of stockinette and YouTube tutorials for when I inevitably got stumped on a step in the pattern. They are soft and warm, and they make me happy when I’m wearing them. Yes, I truly am about the simple things in life. Since knitting this first pair, I find myself being drawn to bright, colourful sock yarn. 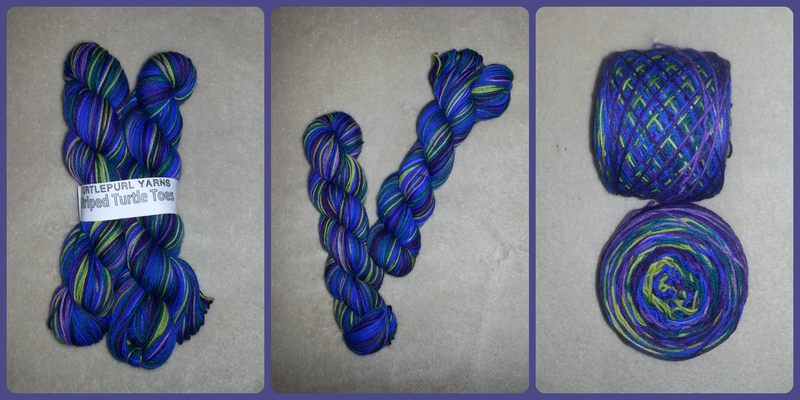 My stash doesn’t need anymore sock yarn… or so the logical part of my brain thinks. These are the things I love about socks. My first pair of socks – a little slouchy, but I love ’em! 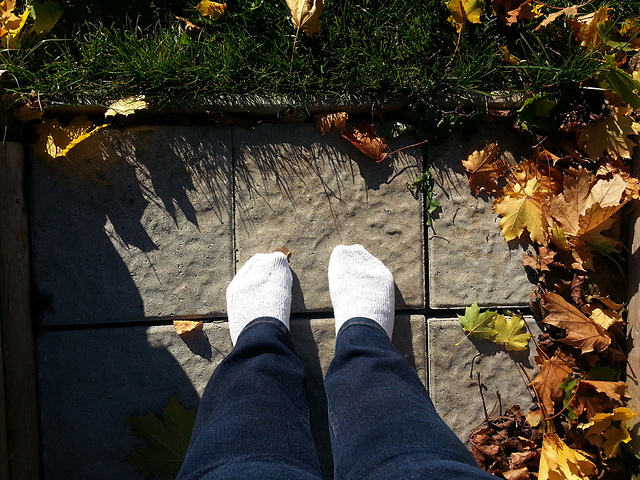 Flip the coin, and oh socks, how I loathe thee. First, and perhaps I haven’t adequately stated this about me, I’m not a patient person. When they were handing out virtues, I seem to have been skipped for patience. I love chunky, bulky yarn, big needles, and the instant satisfaction that comes from starting and finishing a project. I just don’t get that instant satisfaction from socks. The yarn is so fine and the needles so tiny! Maybe with more practice, I’ll get faster at them, but socks definitely test my patience. And then there’s the fact that they are a pair! Once one is finished you have the Yay the project is cast off feeling, but then, alas, you are ONLY HALF DONE!! You get to repeat the process ALL OVER AGAIN!